The Lion is an excellent opening for black, but can also be played with white. Although it has been around for many years The Lion is a relatively unknown opening. The famous chess-player Philidor has written down and analysed quite a few games. Nimzowitsch was the first one playing his knights at f6 and d7 and Hanham added moves pawn at c6 and Qc7. Also Aljechin and Marco have been very succesfull at playing this opening in the twenties. Now the foundation of the Lion has been laid! This immediately brings to light the biggest advantage of this opening: You can always play the Lion. It doesn't really matter what white's first 3 moves are. The first 3 moves are general moves. At the fourth move a variation is chosen. 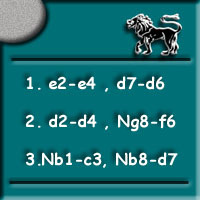 Either by white playing 4.f2-f4, which starts the variation The Lion's den. Or in all other cases by black, being able to choose from: The Lion's mouth, The Lion's head or the Lion's claw. This provides you with theory based moves right up to the twelfth move. Think about it: you control the game, leaving white as spectator. The Lion is not an ordinary opening. First, black doesn't castle (except in the Lion's head). Second, the Queen's knight is included in the battle from c8 through d7 - f8 - g6 to finally land at beautiful f4. A pawn-attack with the g- and h-pawns is also a possibility. For an complete overview of the Lion's features you should look on Variations. You can always play the Lion. Every opening move of white can be answered with the Lion. The Lion can be custom made to your playing style. There are variation for agressive players as well as the awaiting ones. The Lion is fairly unknown. Your opponent is forced into unknown territory early in the game, leaving his precious opening repertory behind. You don't have to wrestle with thick books before seeing some results. Playing the Lion's basic moves puts you in a firm position in the middlegame (or even endgame). You play your own game. Your play doesn't depend on the moves your opponent does. It is clearly your game. Often very exciting and beautiful games develop on the board. The Lion leaves all room for well-thought sacrifices and great combinations. It surely is a break from the ordinary. Leaving well-known ways of developing and attacking creates a whole new game. The Lion lifts your chess strategy to a higher level. Especially for recreational players the Lion is very instructive. The Lion saves you a lot of time. On several occasions I watched the opponents run out of time, after having played only twenty minutes myself. Being on unknown territory forces the opponent to think about the course of play. This also makes the Lion a strong weapon in rapid games and bullet game.